How Amazon’s problem with cheap knockoffs got so bad. Is That Snuggie the Real Thing? Companies and customers are getting fed up with the counterfeits flooding Amazon. How did things get so bad? The Snuggie, that as-seen-on-TV cross between a hospital gown and a blanket, has attained pop-cultural omnipresence in recent years. 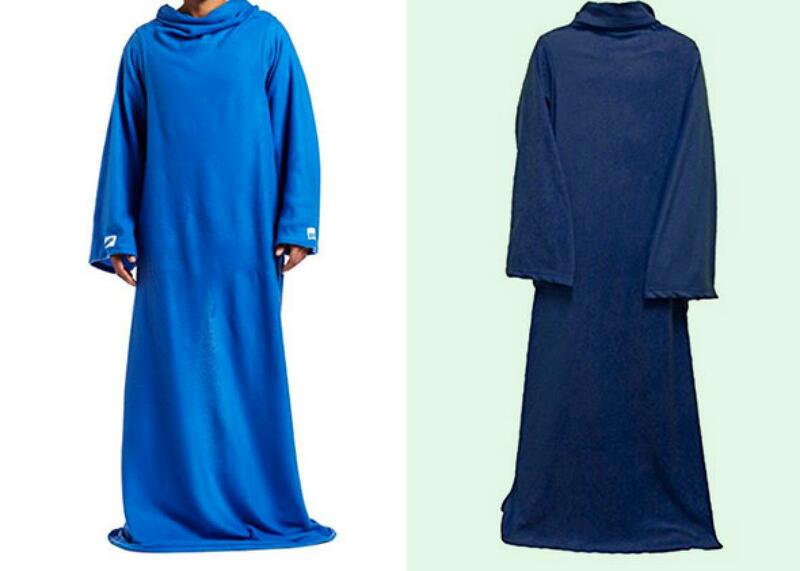 Now it’s coming to a courtroom near you: Earlier this month, Allstar Marketing Group, the maker of the Snuggie, teamed up with two other companies to sue Amazon. They claim the retailer “knowingly and intentionally” allowed a tsunami of faux fleeces, not to mention knockoffs of other products, to be sold on its site. The legal action by the three retailers (the others are Ideavillage Products, which makes compression sleeves, and Ontel Products, which makes Magic Tracks toy cars) is the latest salvo in an ongoing debate: How much responsibility do companies like Amazon, which are not only retailers but marketplaces for other sellers, have to ensure that the goods on their platforms are the real thing? The answer: Not as much as you probably think. Counterfeiters have been a part of the internet’s firmament for about as long as things have been sold online. EBay’s rating system for buyers and sellers originated, in part, as an attempt to combat the sale of fake products. “Fraud on the Internet is increasing as bargain hunters flock to online auction sites to trade in goods ranging from baseball cards to grand pianos,” read a report issued by the Nevada Attorney General’s Office—in 1999. But the problem has become a lot worse. According to the Organization of Economic Cooperation and Development, counterfeits were an almost $500 billion business in 2013. It’s an issue for eBay, and such a problem at Alibaba, that the U.S. Office of the Trade Representative just put the Chinese retail giant on its “Notorious Markets List,” citing the “challenges” trademark and copyright–holders face in enforcing their rights. But here in the United States, Amazon, the nation’s largest online retailer, gets the most attention for the problem. The company’s current woes seem to have originated in a 2014 decision by management to allow Chinese manufacturers to directly list their wares on Amazon Marketplace, where third-party sellers are responsible for about 40 percent of the company’s sales. What happened next isn’t shocking: According to the U.S. Chamber of Commerce, 72 percent of counterfeits confiscated by law enforcement authorities in the United States, European Union, and Japan between 2010 and 2014 originated in China. And indeed, the number of counterfeits and knockoffs available for sale on Amazon surged. No product appeared immune. World-famous brands complained. So did craftsmen. Christopher Beikmann, a New Mexico–based designer who markets iPhone covers decorated with his art, told me that at about that time he began to see products that looked just like his $39.95 phone cases going for as low as $7.95. His sales plunged. “I literally went from doing six figures a year in sales to doing a third of that,” he said. When we spoke earlier this week, he said he no longer sells on Amazon, but counterfeit versions of his designs remain available on the site. Jamie Whaley, the creator of Bed Band, a gizmo that keeps fitted sheets actually fitted on a bed, also took a revenue hit from knockoffs. “When [the counterfeits] showed up, our sales promptly dropped in half,” she told me. When it comes to its marketplace, the courts usually consider Amazon a facilitator, a platform for consumers to connect with merchants, not unlike how Uber views itself as a platform connecting riders with drivers. Amazon’s legal responsibilities include removing fraudulent listings when they are brought to their attention. As a result, chasing down frauds became a time-consuming and all-but-Sisyphean task for many legitimate sellers and copyright and trademark holders. Proving the fraud was on them, not Amazon. And the frequent response of a busted counterfeiter isn’t to stop selling the product but to reopen for business under another account on Amazon, forcing the aggrieved party to start the process over. It’s unclear how successful Snuggie and the other companies involved in the legal fight will ultimately be. Because regulations appear to provide the listing merchant a safe harbor, the courts have ruled, sometimes unhappily, for Amazon and other internet platforms in similar cases. “There is no doubt that we now live in a time where the law lags behind technology,” Judge Ricardo Martinez, the federal judge who presided over an unsuccessful case brought by the manufacturer of pillow cases designed to look like dinosaurs and other animals, wrote last year. Martinez added that he would like to see Congress address the matter. Good luck with that. When Washington did attempt to step in, the internet giants were less than enthusiastic. A bill introduced in the 2011–2012 session of Congress would have hopefully cracked down on everything from pirated copies of Hollywood films to websites carrying counterfeit good. It foundered on a wave of opposition from companies like eBay and Amazon. As a result, some sellers are pinning their hopes on the thought that business imperatives will force Amazon and other retailers to take action. And here we might experience a bit of luck. Counterfeits are now giving Amazon such a black eye that the company is finally starting to improve. Whaley says she believes Amazon is being “more proactive” in combatting the problem, And last month, Bloomberg reported on a new initiative that would begin to ask large companies to register with the site even if they do not use it to sell their brands. If they sign up, Amazon will insist third-party sellers demonstrate the companies are allowing them to sell their wares on the site. Here’s hoping Snuggies are among the products on the list.